Ibiza is full of beautiful scenery and breath taking landscapes, and that is just from the ground. 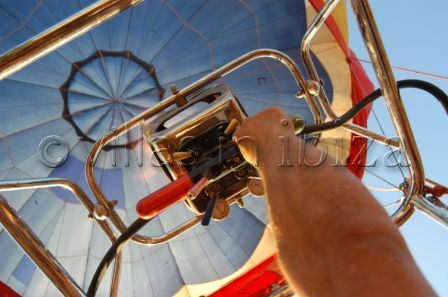 So how about taking in the view from an entirely different perspective, inside the basket of a hot air balloon! ‘Ibiza en Globo’ are offering just that. They can arrange trips for between 2 and 6 people with each person getting 35-45 mins in the air. You can choose either an early morning or an evening flight (around 3 hours before sunset). Ibiza en Globo will pick you up from your hotel and take you to the departure point. Two people can travel inside the balloons basket at once, the other members of the group will follow on the ground until it is their turn inside. After the flights you can enjoy a glass of champagne and a snack while you are awarded a ‘Baptism of Air’ certificate. The transferrals (Hotel-Flight field-Hotel), are free of charge. After being met at our apartment around 7.30pm we set off from Sta, Eulalia and headed toward the centre of the island with Jose and Sergio. Within 10 minutes we were standing at the launch site waiting for the sun to drop a bit as the thermals are less when it's a bit cooler (we were told). It was a bit touch and go as to whether we would get our trip as it had been windy all day. We watched the trees sway a little and helped unpack the balloon from the trailer. We helped out when asked and this made us feel really part of what was happening and not just passengers. 20 minutes later and the balloon was upright and we were jumping in with Jose driving (if you can all it that). Off we went heading further inland and rising up high enough to see the whole island. It was a bit dusty so we dropped back down again and we could clearly see Sta. Eulalia behind us and Ibiza Town to the side. Jose was pointing out places to us and keeping an eye on where we were going and at what height. It was a very sedate and surreal feeling as you drift along over some fantastic villas trying to spot landmarks you recognise. Sergio was following with the trailer and the large 4x4 and keeping in radio contact as we went. It's quite a tight squeeze in the basket and great fun hoping around as you realise that you are now in the forward driving position. Slowly up and down we worked our way in the direction of San An. over wooded areas and towns alike. Hover over towns was great as lots of folks would holler at you and wave as you slowly glided past. You will see the best sunset from the balloon and one you will always remember. Much better than any bar in the sunset strip. You feel like you have the whole sunset to yourselves. After about 40 minutes Jose decided it was time to land and we prepared to hit the ground. We hit it a big field that had just been ploughed so Jose quickly added some hot air into the balloon and up we went again in search of another landing spot. Our fun really began here as landing spots were very thin on the ground and always seemed to be just out of our reach. We continued on and were getting close enough to see the lights of Es Paradis and the Rest of San Antonio but we were a bit north of the resort. Having said that we came over a ridge and were thinking "well if we go over that next one it's the drink". Little did we know that Jose is so good a pilot that with Sergio’s help we landed on a postage stamp piece of land in what I can only describe as the gentlest touchdown we have experienced? We won't tell you how this was done as you really should go and find out for yourself. Finally down and we had our Champagne and were baptised into the balloon flyers club and took some photos. Never took long to pack up the balloon and basket and we soon heading back over to our side of the island. We dropped Sergio off on the way and found out that he had to DJ in Pacha that night and from that little snippet of info we ended up on the guest list for that night. All we can really say is thank you very much to Jose and Sergio. We will remember forever our maiden flight on The White Isle.